We have an open floor plan on the first floor so heat can circulate freely on the first floor before heading upstairs. Our kitchen, dining room, and living room (this last being where the stove is located) do not have doors or walls separating or defining each space. The second floor is heated as the warm air rises… we often have to shut bedroom doors at night to keep from flinging open windows in order to sleep comfortably. 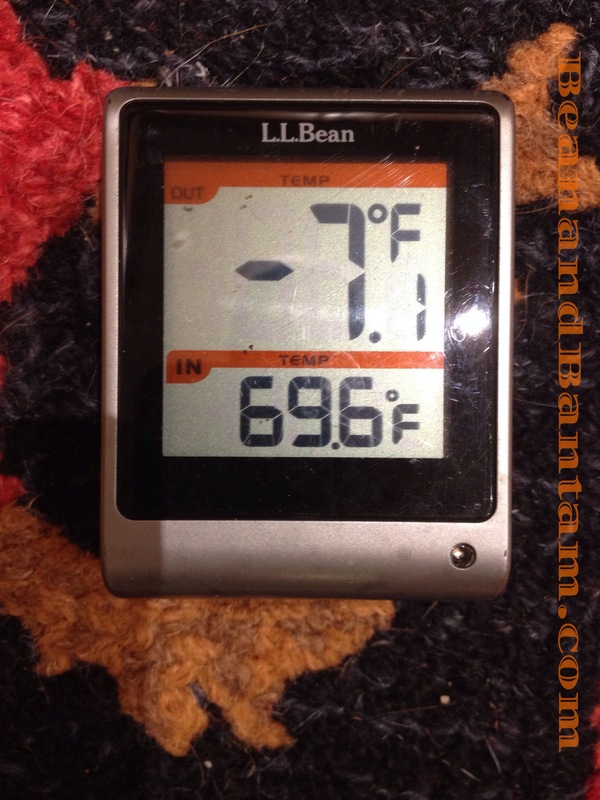 We have a large wood stove: a Harman TL300 Top Load which is about 3 cubic feet, and we can load up once a good bed of coals is established, and then shut down for a slow burn (the Harman web site claims “up to 17 hours of steady, even heat from each load of wood” but we have not seen that… I’d be amazed if I ever saw that… we can leave the house in the morning and come back at night to a good bed of coals that re-catch if you put a couple logs on, without a big fuss). This is not a drafty old house any longer; we have double-paned energy efficient windows (and the house has been insulated, wrapped, and re-sided), and we aren’t afraid to throw open those windows for some fresh air, even during a snowstorm. Because, that stove can seriously crank out some heat and there are winter days where we miscalculated the outside temperature, and loaded in too much wood, or burned it a little too open, and it’s then 74 or 80 F inside the house and we start wilting. Too much heat has, just once or twice, led me to throw open all the windows downstairs and stand in front of a nice winter breeze to cool down just a bit (and fresh air is always good, when things get shut up all winter long in most New England houses). We don’t travel during the winter; if we were to travel, we would need to have someone house sit to literally “keep the home fires burning,” or frozen pipes would become an issue. Frozen pipes or frozen sewer lines mean that at first thaw, water rains down your ceiling and walls, and your house is essentially flooded and ruined. By travel, I mean we don’t leave the house for more than 8-10 hours. I should put this item first. None of this would be possible if my husband didn’t split, stack, and haul fire wood, and a lot of it. It’s a lot of work. He is definitely to be commended. This past summer he split and stacked an entire log load of wood: an entire logging truck was unloaded at the top of our driveway and converted, through his labor from full size logs to neat stacks of split wood. The result is that so far, we’ve done well with just the wood stove. We will eventually move the boiler over to the new chimney, hook it back up, and connect the piping throughout the house, but before we do, there’s some renovation that has to occur on the second floor… now that the first floor is pretty much finished. I would love to hear your experiences heating with wood, please feel free to share in the comments below, or ask any questions. Hi Daphne – we have heated our house with wood for almost 40 years now. When we bought our acreage in 1975 I was concerned we would end up clearing off the 5.5 acres to heat our house. Now 40 years later I realize how little impact our wood burning has had. Every winter we are hit with a number of windstorms that usually provide enough firewood for the following year. I cut and split about 4 cords of wood every year and that gets us through our usually fairly mild West Coast winters. We’ve been through a succession of wood heaters over the years from tin airtights that used to turn red hot and start hopping around the floor to a thermostatically controlled Ashley that was dismal to say the least to our great wood stove with glass door which is a delight. The best times are when the power goes out and we can be warm, heat water and cook meals while our neighbours huddle around their camp stoves. Wouldn’t trade it for anything else although 5 years ago I realized the thrill of splitting wood had departed and I invested in a hydraulic wood splitter. A good investment! Welcome Kenneth. Yes, we get some windfalls, and cut some trees that are heading the wrong way, and help others cut wood on their land and get a share that way, but we also buy our wood… about six cords I think, to be really set for a winter with some weeks of below zero temps. It’s wonderful in a power outage, and you are right, glass doors are a delight! Hi there Robin! We haven’t yet cooked on it, but it’s certainly big enough to. Next power outage maybe? So glad you are enjoying my blog. I have a few bird posts planned, one on a yellow shafted flicker, and another on a robin. Stay tuned! I love your stove! Don’t they just ooze character? 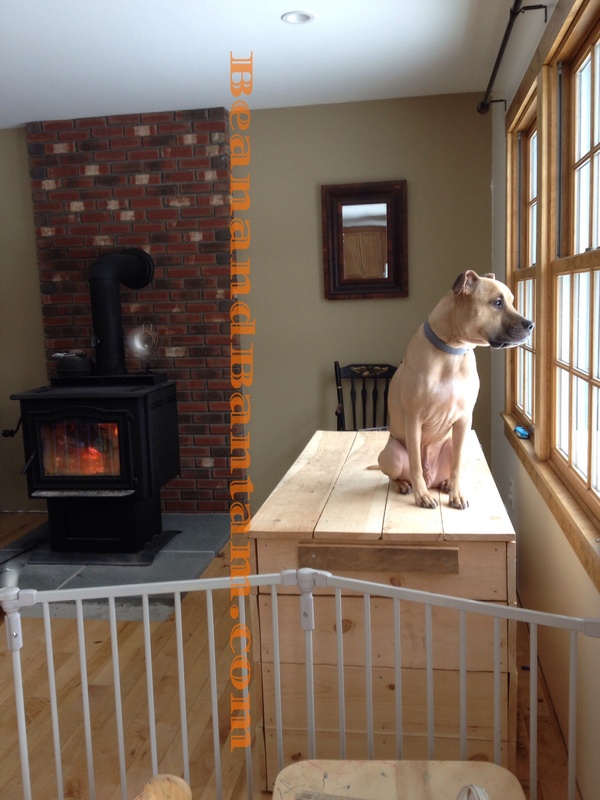 Like Kenneth, we’ve heated with wood for nearly 40 years (although now it’s supplemented with a furnace). And we’ve had the same Shrader stove all those years. Even took it with us when we moved to our small farm in 1982. I also agree with Kenneth about how little impact is necessary for a good supply of wood. Storm damage provides all I can cut for a year. My favorite part is the magnetism of the enveloping heat. It still draws my grown kids to its side, knitting the family together. Hi Dan, what good insights, thank you. Wood stoves and fireplaces do have a magnetic quality, drawing us closer, and bringing people together. I have always loved the feel of wood heat. There is nothing like it for the aging, aching, creaking joints and bones of mine. I live in a location where wood heat is banned in new construction and remodeling because of air quality issues. It is unfortunate yet understandable. Having a 20 year old home that was built prior to the regulations, We do have a wood burning fireplace for atmosphere but it is not adequate for heating the house. Loved your post! I agree, there is nothing like wood heat. I think the air quality issues are improving, our stove has some sort of fancy damper that is supposed to provide a much cleaner burn: the air goes through two combustion cycles before going out the chimney, and the stove is “EPA certified” for clean burning. It was definitely a learning curve at first. Daphne, do try cooking on the wood stove–food does taste exceptionally good when cooked that way! Maybe my tastes echo Caveman days. Scrambled eggs are amazing. With hash browns. Soups work really well,too. 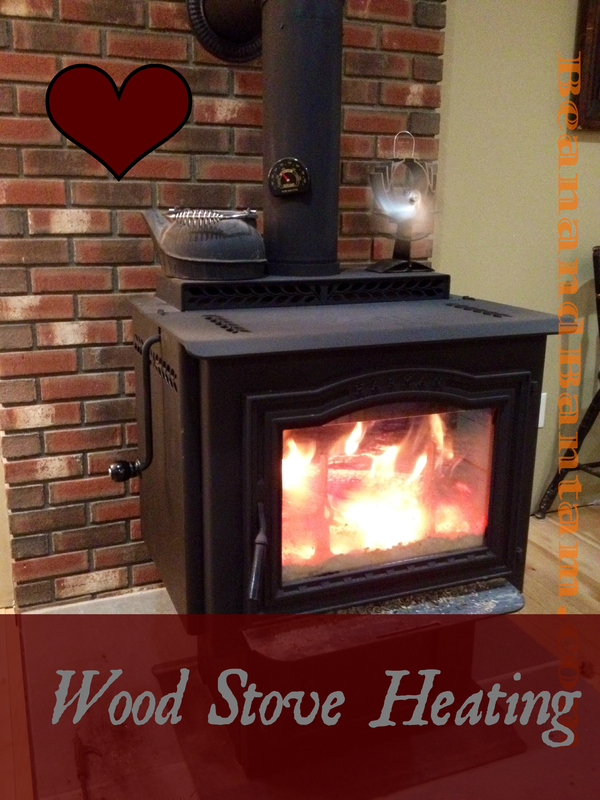 Yes, I’ll have to do a post on recipes for the wood stove, and cookware! Janine and I are working around our wood stove here in northwest Iowa. Where we lived previously in a converted soybean storage bin (essentially a one-room cabin with sleeping loft) we purchased a stove much too big for the space, so experienced sauna-like conditions when it was burning efficiently. In our ramshackle place we’re living in now, a 60-percent efficient wood stove heats nicely, with enough extra to influence the house thermostat to not kick in the furnace. I’m not sure if we’re saving much money, but we’re definitely in touch with our little climate inside. I, too, scrounge wood, but drying conditions aren’t great in our neck of the woods, so it’s one or two seasons before anything green is conditioned enough to burn. Our city maintains a garden waste and wood dump site, so there’s that, too. My little chain saw works very well for scavenging, as long as i keep the chippers sharp. Love your site, the huge photos and the descriptions you have. Keep it up! I have enjoyed looking through your blog! Nice photos and thoughtfully written. We have heated our house here in southern Rhode Island with wood only for the past 20 years. We bought a used Jotul 8 stove in 1992 which still serves us very well. Toasty warm –sometimes too warm! But the coziness factor can’t be beat. Impressive the commitment that it takes! There is a nostalgic aura to it though. Hi Tina, thank you! I agree that there’s no better more enveloping heat than wood. When it’s good, it’s the best, and even when it’s a lot of work and bother, it’s still good. Thank you for stopping by.